Villa Adriana, Villa d’Este, Ostia Antica, and the Castelli Romani are some of the many trips outside of Rome that can be added to your itinerary, especially if you plan to stay in Rome for more than 3 days. All these attractions surrounding the capital are fairly close and suited to one-day trips. Below, we list some of the best and most popular places for a day trip outside of Rome that surely won’t disappoint you. This exciting tour will guide you to Villa d’Este, one of the most fascinating late Italian Renaissance sites, with its beautiful waterfalls, gardens, and trees, and on to the gorgeous Villa Adriana, built in the second century A.D. Villa Adriana is considered the largest and most luxurious residence ever built for a Roman emperor. You will admire the caryatids, the columns of the Canopus and the Serapeo, and many other treasures that will take your breath away. 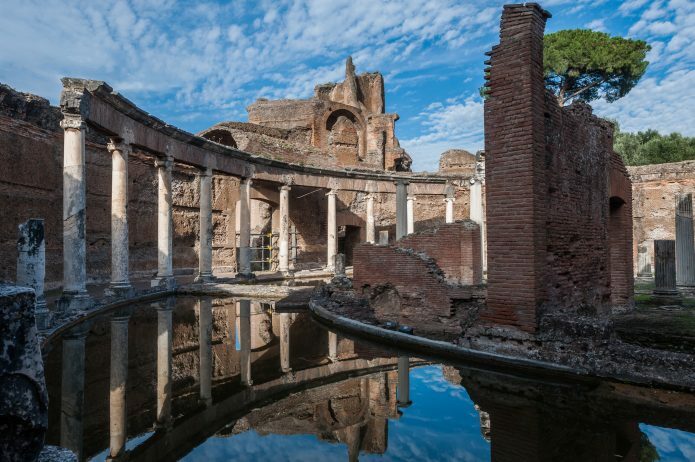 At Ancient Ostia, you will discover one of ancient Rome’s largest archaeological sites. You will step back in time into the Roman colony, founded between the end of the 5th and the beginning of the 6th century, then developed into a commercial city and harbor of the Roman Empire. You will admire the theatre, various buildings, production facilities, temples, portals, and much more. This tour will guide you in discovering the fascinating countryside and historic villages at the gates of Rome. As you leave the city, you will admire the ruins of the Terme di Caracalla. You’ll later reach Via Appia and take the beautiful Via dei Laghi, which winds through the Albani hills. You can also stop at Frascati to enjoy the famous local wine and blend into and absorb the atmosphere of this beautiful town. Enjoy an entire day in one of Europe’s most famous amusement parks, with its water games and many thrilling attractions. Don’t miss the opportunity to watch the dolphin show, admire marine seals, penguins, and flamingos, and take a walk through the enchanted forest populated with colorful toucans and other exotic birds. Perfect for a trip outside of Rome with children.